This Scratch Card scheme is exclusively applicable only in the state of Kerala. Participants should be an Indian citizen, residing in India. Unibic employees and their family members are not eligible to participate in the contest. This contest is effective from June 1st till July 20th and running all over Kerala. This scheme is available for end consumers only. 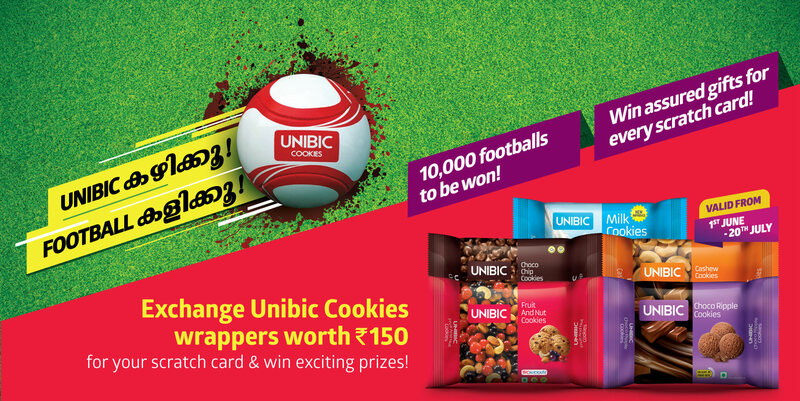 The end consumer shall get one scratch card for every purchase of Rupees 150/- worth of Unibic Cookies. The end consumer need to scratch the card and when football is reflected on the card then the end consumer shall be eligible for one football with Unibic Logo printed on it. The end consumer shall get assured gift of Rupees 5/- (or) Rs 10/- worth of Unibic Cookies on scratch card where football is not reflected. The end consumer can redeem the gift in certain redemption centres. For the list of redemption centres, call 7356338281 between 9:30AM & 5:30PM or contact your nearest Unibic retailer. The end consumer needs to produce the empty wrappers worth Rs 150/- at the redemption center to get the scratch card, any alteration or defaced scratch card shall not be acceptable and company reserves the right to cancel the scratch card. Unibic shall entertain only untampered & authentic scratch cards. Unibic is not liable for any guarantee or warranty of the football purchased from third parties. Manufacturer’s warranty will apply to the football. The end consumers cannot hold Unibic liable for any physical injury or mental trauma or monetary loss/damages on or during the course of the contest or arising out of this scheme. Unibic shall not be responsible for any charges, levies, costs incurred by the end consumer to participate in this contest. Indemnity: The end consumer agrees to indemnify and hold harmless Unibic, its affiliates and Unibic’s contractors and each of their respective employees, officers and agents from and against any claim, loss, liability, damages, cost (including legal costs) of any person, firm or corporation, including, without limitation, legal fees, arising out of any breach of any of the terms and conditions of this scheme by the Participant. The participant needs to go through the detailed Terms & Conditions of this contest mentioned on the back of the scratch card and also available on www.unibicfoods.com to avail the offer and unconditional acceptance of said terms and conditions of this offer is required from eligible purchaser/participant. Please go through the detailed terms and conditions of this offer before accepting this offer/scheme. Your participation in this scheme shall be deemed as unconditional acceptance of said terms and conditions of this scheme. No cash shall be paid in lieu of football or Unibic Cookies worth of Rs. 5/- (or) Rs 10/-and no request shall be entertained for exchange of football or Unibic Cookies worth of Rs. 5/- (or) Rs 10/- of equivalent value. Unibic reserves the right to change, modify, alter or withdraw the entire scheme or any part, thereof and the company is not liable to pay any compensation. Unibic’s decision regarding the same shall be final and binding. In case of any dispute only Bangalore Courts will have jurisdictions.